This is from one of my handouts for the Zentangle program I did for my calligraphy guild last month. Zentangles are wonderful images created by repetitive patterns. Each pattern is called a "tangle" and is achieved by following a certain set of instructions. As pictured above, I think Zentangles work well with Neuland, Lombardic Versals, and Contemporary Caps. Here I am trying to explain what a Zentangle is. A traditional Zentangle is done on a 3.5" x 3.5" tile. You can learn more about Zentangles at the website of founders Maria Thomas and Rick Roberts by clicking here. Once there, you can sign up for a free, monthly newsletter. Most issues of the newsletter feature a new "tangle" to learn. You can find all the old tangles in the newsletter archives. Members from the Calligraphy Guild of Indiana giving Zentangles a try. CGI has a great guild. There were over 30 people in attendance. This is our guild's secretary, Karen Paradiso, working on her Zentangle. I seem to only be allowed 5 photos per post. If you would like to see more, including the Zentangley Christmas card I made for 2008, please visit my Zentangle album over at Flickr here. My thanks to the wonderful Wendy Dougherty for sharing her photos with me! You can also check out the very, talented Erica McPhee's blog to see what she learned at a "Zenspiration" workshop with Joanne Fink here. I've really got to watch my Zentangle dvd. Your work is so amazing and inspiring. Now, all I have to do is find the time. Fabulous job, Jane! Jane, I so love the Fruit of the Spirit canvases. What a great idea! I have done Zentangles before, but didn't think to make letters with them - that is so cool! I wish I could have been at your presentation! 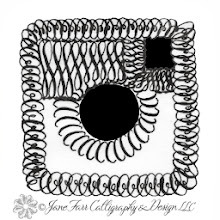 Oh Jane - your Zentangles (like your calligraphy) is exquisite! Thanks for link love! Your blog is sooo amazing and inspiring. :-) Thanks for all the wonderful sharing.